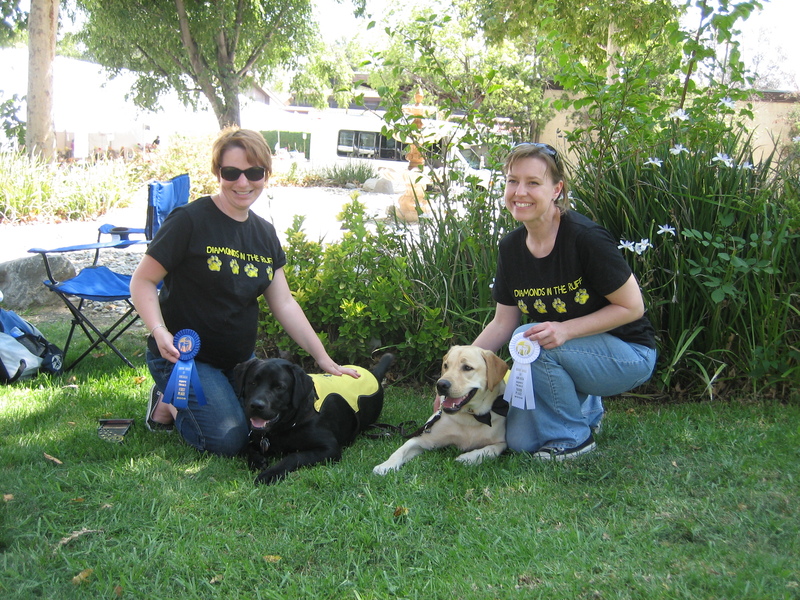 2008 marked the 60th anniversary of the founding of Guide Dogs of America, so the Open House theme reflected that. Because he is classy and sophisticated, Truman decided to wear his fancy bow tie for the occasion. 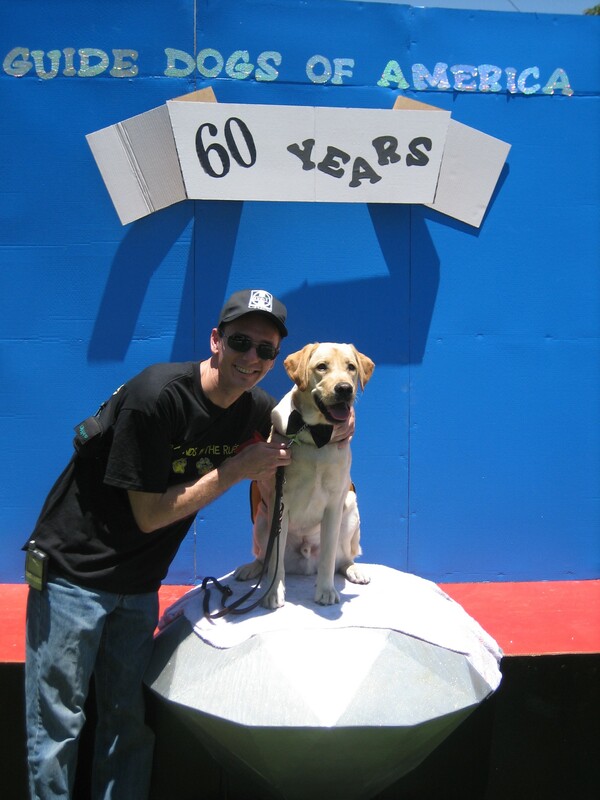 Here he is, posing on the big diamond at the photo backdrop, with Wolf. It was Wolf’s first GDA Open House, and for someone who was not yet my husband at the time — we had only been dating about four months, actually — he was not just a good sport, but actually quite enthusiastic! Wore the t-shirt and everything. My puppy raiser friends were impressed. I already knew that he was a keeper. 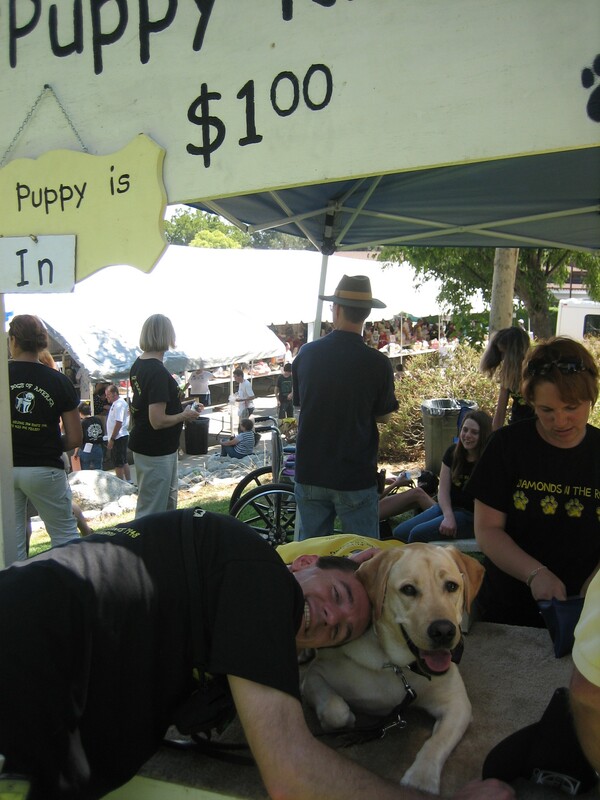 Here’s Wolf with Truman at the puppy kissing booth. Ridiculously cute and lovable, both of them. The annual puppy trials are always a big draw for spectators, and a little nerve wracking for me. I wasn’t expecting much, considering what a total freak of nature Truman had been during the entire 2007 Open House, but the little man surprised me and earned the 3rd place ribbon in his age group! We were very proud. Less cool was the number one verbal response to our third place win: “And…how many dogs were in the category?” Yes, people, Truman is a force to be reckoned with, and I have done my fair share of reckoning. But let us have our moment, will ya? This entry was posted in GDA events, Littermates, TRUMAN. Bookmark the permalink.